Hi Sherry, you have one of my all time favorite plants - this is one of the Aeonium, a group of lovely, easy to grow and relatively care free plants. They originate in the Canary Islands, where the weather is warm all year, and withstand drought and quite bright conditions. I have seen the advice to give them some shade, but in cooler climates this might be a mistake. They do well for me under lights for the winter, at which time they don't receive much water. They also have a dormant period in their native habitat in the summer, when they don't like much water too. The blooms will amaze you - hopefully, some new rosettes will emerge from around the base of the stem or out of the larger rosette, as these are a plant that will die off after blooming. One way to ensure that there are rosettes is to behead the main one, forcing new growth from below this point. 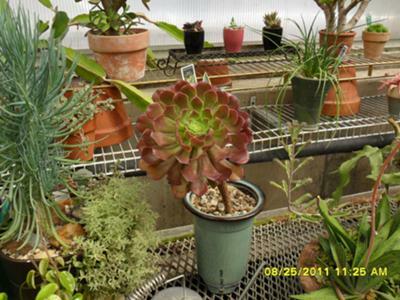 See the page on Succulent Plant Propagation for more. See also the page by a visitor showing the height of the blooming stalk - it will shock and amaze you; What is this Plant in our new Home?